THE Si Chuan Dou Hua Restaurant at the Parkroyal Kuala Lumpur will be having its UOB Chef’s Creation promotion until December 30 this year. 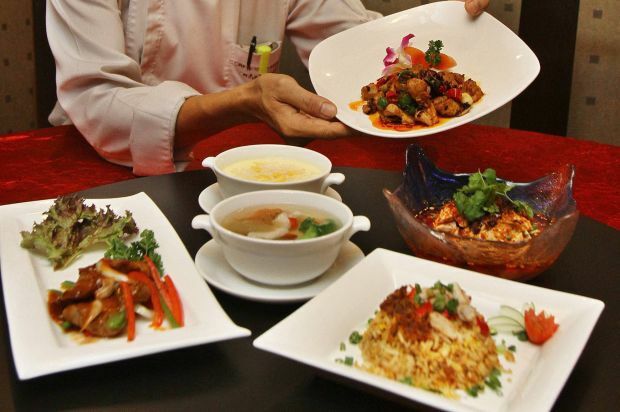 The promotion is a six-course dinner comprising traditional Sichuan and modern Chinese dishes prepared by Chinese Cuisine Chef Eric Chew Chee Kuong. “Most Sichuan dishes are spicy because of the climate and the ingredients found in the area. But for this promotion, we have combined both,” he said. The first course is Chilled Chicken in Spicy Bean Paste. “This is a traditional Sichuan dish. It has a layer of oil which gives the chicken a smoother texture. The chicken is also chilled to give it a unique taste,” explained Chew. “If there is not enough oil in it, the texture will be different even if you use other ingredients like fish,” he added. The second course was the Double-Boiled Pearl Shark’s Fin Soup with Fish Maw and Dry Scallops. “As the spicy chicken dish will numb the diner’s sense of taste, it is good to have some soup to relax the tastebuds,” said Chew. The next dish is Stir-Fried Diced Chicken with Lao Gan Ma Sauce, which is a chilli and black soy-based sauce. “Lao Gan Ma is a type of sauce from China. It is quite well-known there like how the Malaysians are well acquainted with Marmite Chicken,” said Chew. “A lot of the ingredients used in Sichuan cuisine are imported. If you buy it locally, the quality is not as good and the taste will be different,” added Chew. Stir-Fried Beef Chinese Style is a must-try, especially for meat lovers. “Although this is a simple stir-fry dish, what makes the dish stand out is the beef we use — it is imported from New Zealand. We only use beef tenderloin to ensure that the meat is tender and juicy,” he said. The last dish before dessert was Seafood Fried Rice with XO Sauce. “The XO sauce is made with very expensive ingredients. The fried rice has ingredients like chicken floss, prawns and dried scallops,” said Chew. To end the dinner, diners are served with Chilled Mango Sago with Ice Cream. The dinner set menu is priced at RM169++ for two persons. There is also a lunch set menu under the promotion which features dishes such as Steamed Prawn Dumpling with Spinach ‘Har Kow’, Shanghai Minced Meat Bun with Superior Stock, Si Chuan Spicy Squid on Hot Plate, Fried Sliced Venison with Leek in Spicy Sauce, Fried Rice with Crabmeat and Egg White and Sweetened Ginseng with Gingko Nuts and Red Dates. The lunch set menu is priced at RM88++ for 2 persons. The promotion is exclusive to UOB debit card and credit card holders.